If you’re a fan of potato skins, you’ll love the crisp, slightly chewy texture of these skinny spuds and how sturdy they are for dips and appetizers. 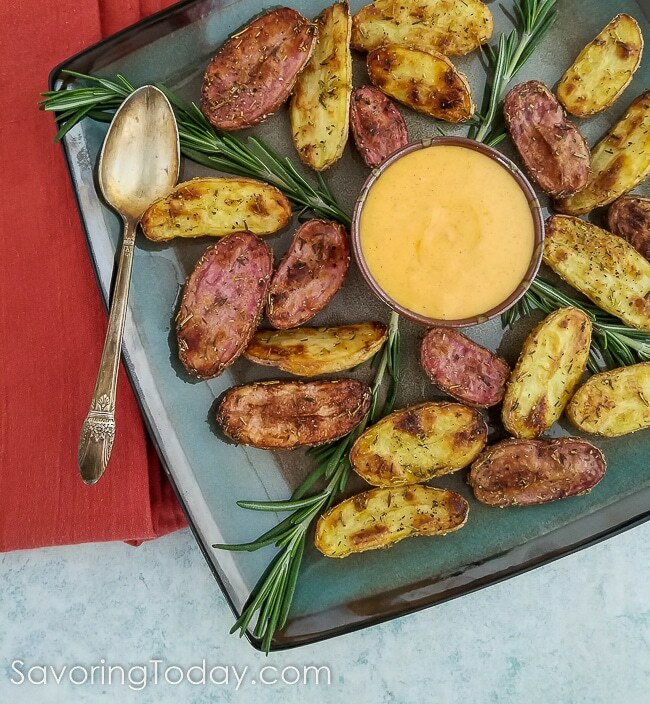 Take these Rosemary Roasted Fingerling Potatoes with Gochujang Aioli to parties for a tasty grain-free dipper, perfect for two or three bites. Roasted fingerling potatoes score big points around our table as an easy appetizer or side dish. Typically, we eat lower-carb vegetables, but when we do add potatoes to the menu, it’s fingerlings I reach for most. get their name from their shape—they look like knobby fingers. These tubers are an heirloom variety and unlike new (baby) potatoes, fingerlings are fully mature when harvested. The most common are Russian Banana, Butterfinger, French Fingerling, Rose Finn Apple, and Purple Peruvian. The colorful mixed bag makes the most visually interesting dishes! Why choose fingerlings over other varieties? Easy prep—the delicate skin doesn’t need peeling (this is where I’m pickier about buying organic). Because of their small size, most recipes require minimal cuts. Like other waxy potatoes, fingerlings are lower in starch so when eaten in small quantities, can be a better choice. Their unique shape adds interest to ordinary meals without much effort. Leave whole for roasts, slice in half for quick baking, or cut into coins for salads. Just to be clear, this is not a plug for a brand and you can use any baking pan for this recipe. However, you’ll notice in the photos I am using a cast iron pizza pan so I thought I’d tell you about it. I received it as a gift to a replace a pizza stone that broke, and I love it! 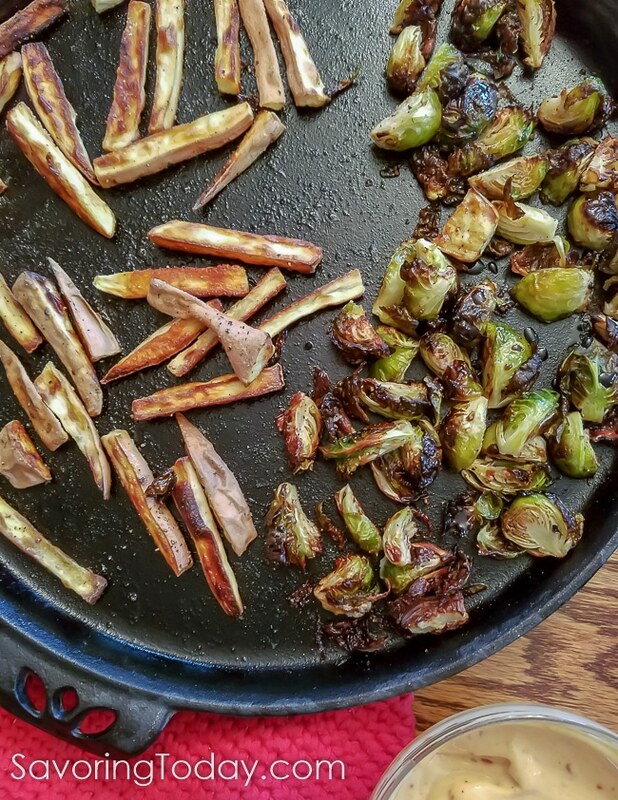 Like all cast iron, it does an excellent job browning so it’s ideal for pizza crust, but I use it most often for roasting vegetables or as a griddle on the stove top. Convenience TIP: It stays in the bottom of the oven to maintain even heat when baking, just like the stones do, but there’s no worries about it breaking. , and in most department stores. Sweet potato fries and Brussels sprouts ~ two sides done at the same time! Fingerling potatoes dusted with rosemary and roasted on a cast iron pan for a crisp, yet slightly chewy texture to serve with dips, appetizers, or fondue. In a large bowl, toss the halved potatoes with enough oil to thinly coat. Sprinkle the herbs, salt and pepper over the potatoes and toss again to evenly cover. Arrange on a cast iron pizza stone or rimmed baking sheet and bake 20 to 30 minutes, until golden brown. For more even browning, turn the potatoes over on the pan halfway through the roasting process. Remove from the oven and season again with sea salt, to taste. Serve warm with dipping sauce. Gochujang Aioli is homemade condiment awesomeness. I first got hooked on this savory Korean red chile paste when I made Korean Barbecued Skirt Steak and quickly recognized its superpowers as a garnish with roasted butternut squash. Its complex, sweet heat perks up any dish whether it’s a dip, garnish or sandwich spread. are two delicious brands I’ve tried and recommend. You can even make authentic gochujang at home! Note: This gochujang aioli recipe is based on my Healthy Homemade Mayonnaise, which is the way to go! BUT, if you choose not to consume raw eggs, substitute 1 cup of regular mayo for everything except the gochujang and garlic. The savory, earthy spice of this unique red chile paste blends seamlessly with the subtle garlic notes of aioli. Use as a dip, garnish or sandwich spread. If using an immersion blender: Add all ingredients to a tall (6-inch) cup or jar large enough at the base for the blender to fit with at least an inch of space around the blender. Immerse the blender in the ingredients in the jar, using the blender to gently lift and stir while processing on high until well blended and creamy. If using a food processor: Add all ingredients except oil to food processor bowl and pulse to combine. Then, while the machine is running, slowly pour oil in a steady stream while processing until well blended and creamy. Taste and add more chile paste or salt, as desired. Although a food processor does a fine job, an immersion blender is ideal and foolproof as the ingredients can all go in together so "slowly adding the oil" isn't necessary. The aioli will thicken even more when refrigerated. Use within one week. 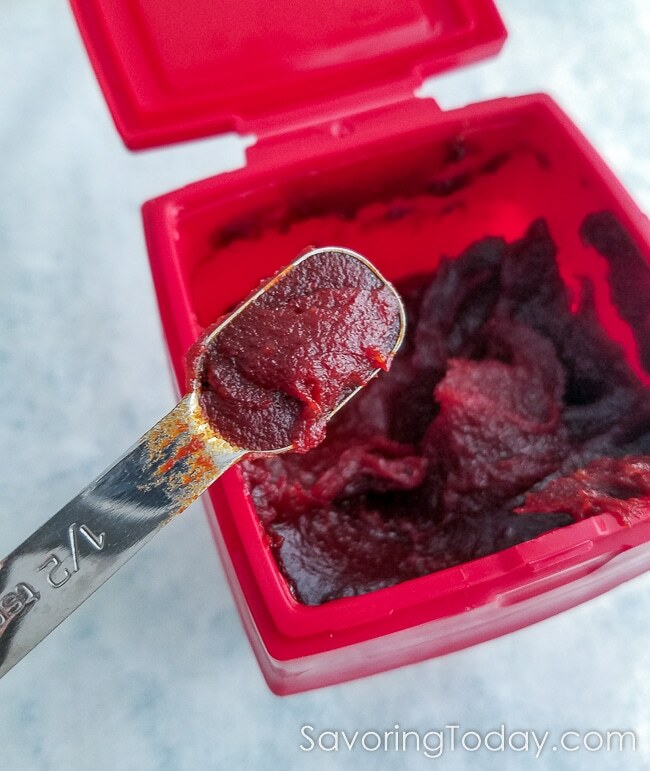 For Paleo: Check gochujang labels carefully or create your own delicious homemade Paleo-friendly gochujang paste. » Start with a platter of roasted fingerlings as a sub for chips in Smoky BBQ Chicken Nachos. » Use leftovers in a potato salad, breakfast casserole, or warm in a skillet for easy home fries. 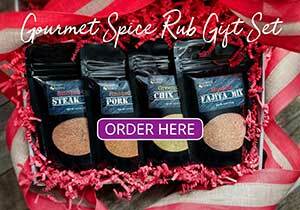 » Serve with Hot Artichike Dip or Caramelized Onion Dip at your next party. If there’s another way to roast potatoes without rosemary don’t bother to tell me. Rosemary and potatoes were meant to be go into the over together. Now, about that aioli. Never have thought to use gochujang in this way. I’m definitely going to give it a try. Thanks, Judy! 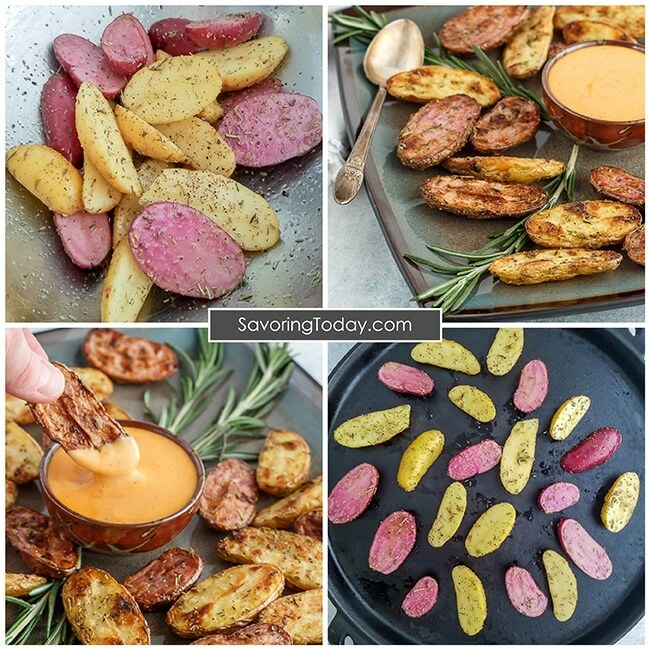 Love the idea of using gochujang in a dipping sauce…great idea with the roasted potatoes. Love roast potatoes! Almost never use fingerlings, though — really need to give that a try. And like the idea of roasting on cast iron — no pizza stone, but I do have a cast iron griddle that needs more love. 🙂 BTW, the Gochujang Aioli looks spectacular! Everything about this meal is heartwarming! Great recipe, thank you. 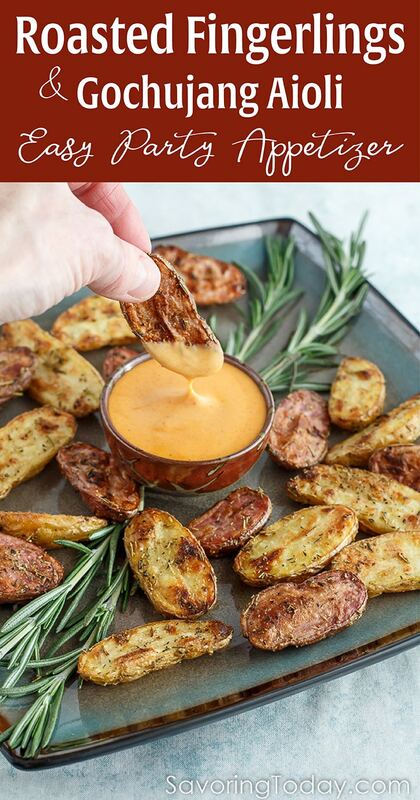 I make rosemary roasted potatoes all of the time, I’ve never dipped it in a Gochujang Aioli. That sounds absolutely awesome! Thanks for taking the roasted potatoes up several notches. Giving this a try!